Hawkeye is another sharp-shooting addition to the Kotobukiya ArtFX+ Avengers Now series. Behind his dark glasses, Hawkeye's stare is always on his target. Wearing his slick black outfit, he can move in the shadows, ever-watching and ready to strike. Along with his fellow Avengers, Hawkeye stands ready! 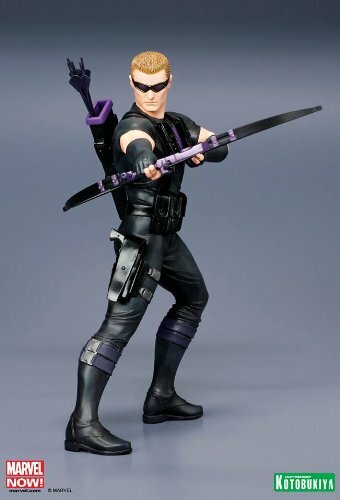 Based on the artwork of Adi Granov, Hawkeye stands 7 ½ inches tall (in the ARTFX+ 1/10th scale) on his included magnetic display base.